self-governing, unincorporated territory of the United States. The city is a modern metropolitan center with a population of more than 395,000 people. It surrounds the Bay of San Juan with the newer portions of the city towards the southern end of the bay. Cruise ship visitors tend to focus on the historic Old San Juan section of the city. Many of the historic sites and museums are located in this section. In addition, most cruise ships dock in this section. Especially for visitors on ships arriving in the afternoon, there is not enough time to venture further afield. Although people in the areas frequented by tourists often also speak English, Spanish is the official language. While it is easy to become captivated by the romantic charm of sections like Old San Juan, visitors should keep in mind that San Juan is a modern urban center. Thus, visitors should exercise the same common sense that they would exercise in any big city. 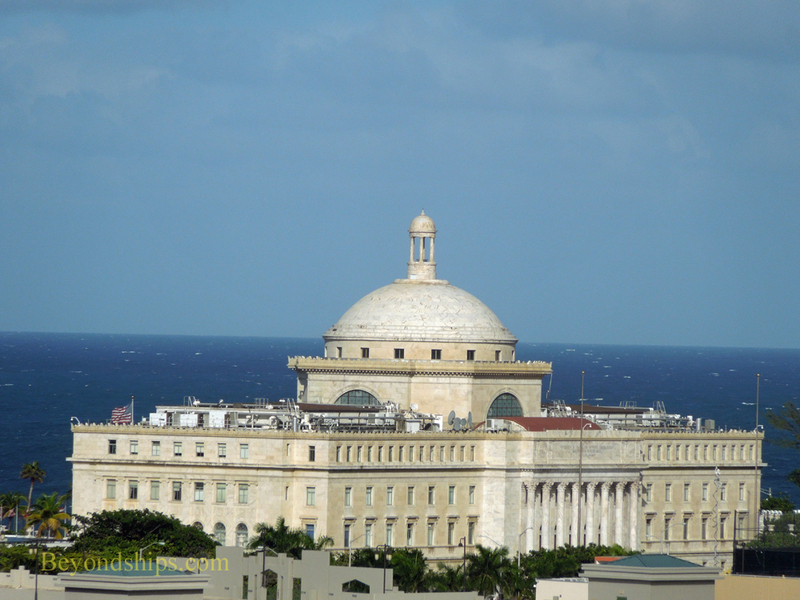 Above: The Puerto Rican capitol building, El Capitolio. Puerto Rico has an elected governor and an elected two-house legislature. Below: A street in Old San Juan. 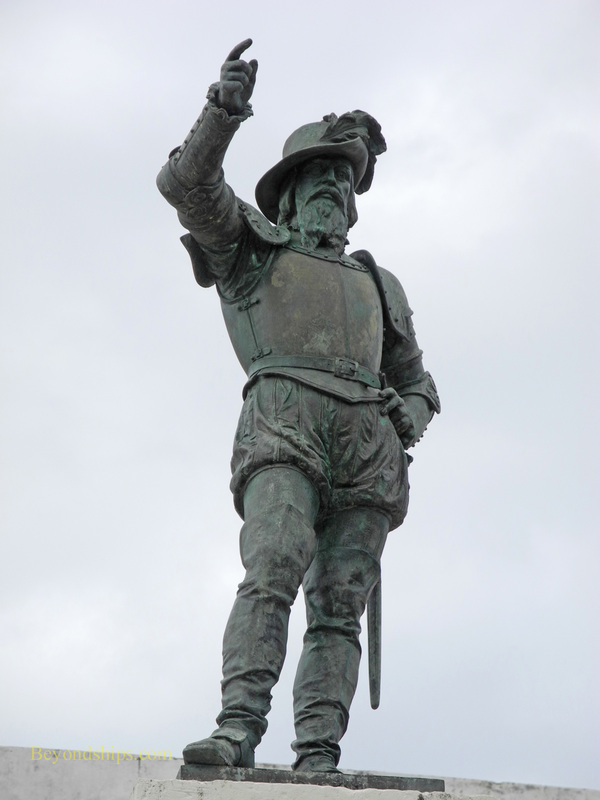 Above: A statue of the famous explorer and first governor of Puerto Rico Juan Ponce De Leon. Below: A section of the walls. Above: A monument along Paseo de La Princesa. 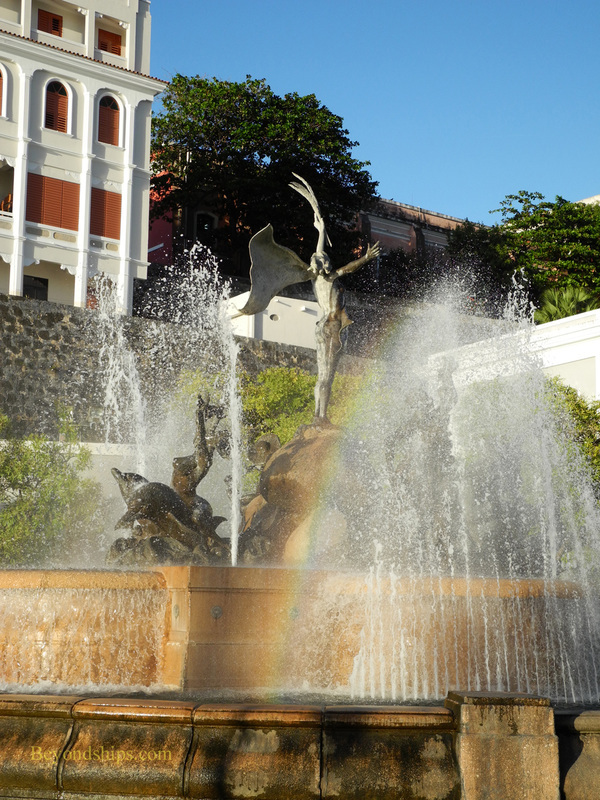 Below: The Raices Fountain celebrates San Juan's ethnic heritage. 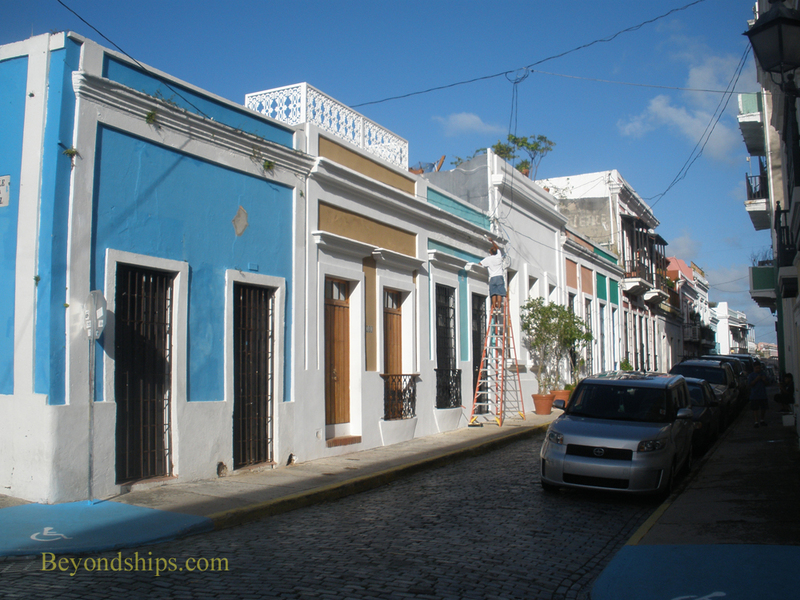 San Juan is the second oldest capital city in the Western Hemisphere. (The oldest is Santa Domingo in the Dominican Republic). The story begins in 1493 when Christopher Columbus encountered the island during his second voyage. He claimed it for Spain and gave the entire island the name "San Juan Bautista." One of the gentlemen explorers in Columbus' entourage was Juan Ponce de Leon, who was to play a major role in the exploration of this island and the founding of the city of San Juan. After the end of Columbus' expedition, Ponce de Leon became involved with the settlement of the nearby island of Hispaniola. While there, he heard stories of gold and fertile land on the island that he had visited with Columbus. Excited by these stories, Ponce de Leon led a number of expeditions to the island where he indeed found gold and good land. This pleased King Ferdinand II of Spain who confirmed Ponce de Leon as governor of the island in 1509. A year before, Ponce de Leon had established a small settlement west of San Juan Bay. He now moved the settlement to a place known as Puerto Rico (rich port) and gave it the name "San Juan Bautista de Puerto Rico." Over the years, the town would come to be known as San Juan while the name of the island became Puerto Rico. 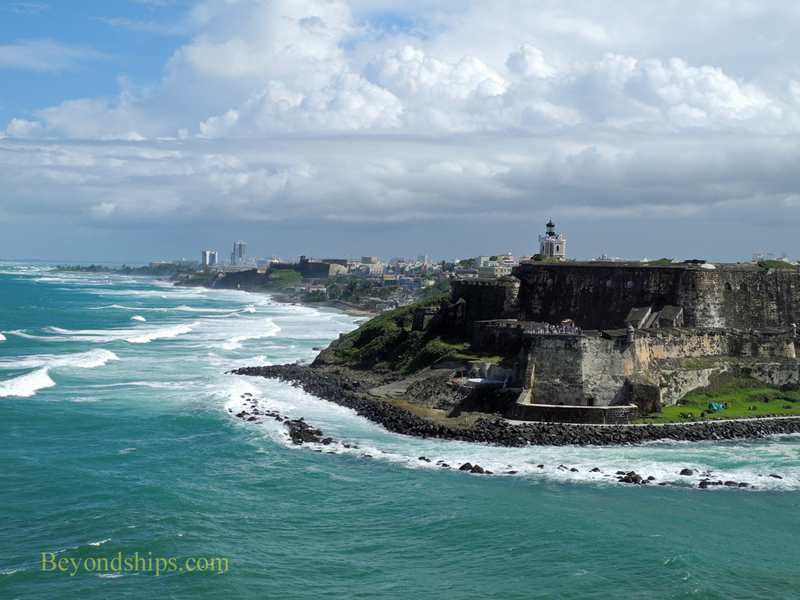 Because of its location and excellent harbor, San Juan became an important stopping off point for the convoys taking gold and other precious items from the New World to Spain. The town grew prosperous. This, of course, attracted the interest of the other European powers. 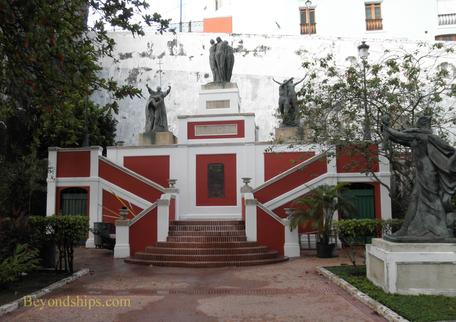 As a result, San Juan's history is marked by numerous battles. In 1595, the English under Sir Francis Drake unsuccessfully attempted to take the city. A few years later, in 1598, the English under the Earl of Cumberland tried again. They were somewhat more successful but had to abandon the siege when exhaustion and sickness befell the troops. The Dutch burnt the city in 1625 but were unable to take the fortress of El Morro. In 1797, the British under Sir Ralph Abercrombie made yet another unsuccessful attempt at invasion. These continual attacks led the Spanish to fortify the city. A massive wall was built around the city and two enormous fortresses were constructed. 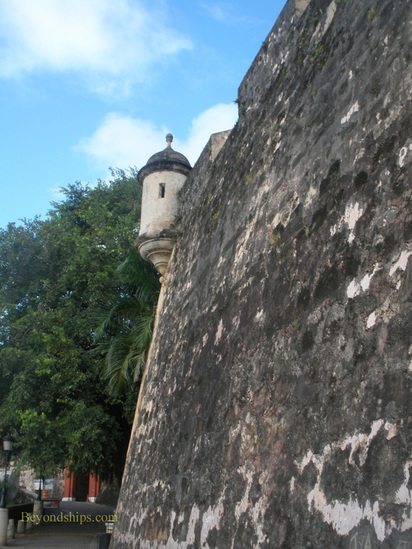 The remains of these fortifications continue to dominate the Old San Juan section of the city today. During the Spanish American War, one of the fortresses exchanged fire with U.S. Navy ships. Although this was an inconclusive engagement, the peace treaty ending that war passed control of Puerto Rico to the United States in 1899. In 1947, Felisa Rincon de Gautier was elected mayor of San Juan thus becoming the first female mayor of a capital city in the Americas. She remained mayor until 1969. The San Juan Uprising took place in 1950 when militants seeking independence unsuccessfully attacked La Forteleza, the governor's residence. Two years later, Puerto Rico ratified its own constitution and became a self-governing commonwealth of the United States with San Juan the seat of government. Subsequently, there have been three plebiscites asking whether the island should become independent, become a state or stay as it is. Each time the majority has favored the last option.